Healthcare is a vital and passionate issue for Georgia’s 13th Congressional District. As your Representative, I continue to fight for a thriving healthcare system in this country, which focuses on prevention and better health outcomes for all Americans. That is why each year I host a Health Fair for my constituents to receive free preventive medicine and medical screenings from our region’s leading healthcare professionals. Join me at this year’s 13th Annual Health Fair on Saturday, August 19, from 9 am to 2 pm, at Mundy’s Mill High School in Jonesboro. 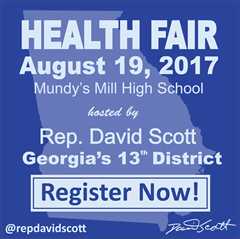 Register now for the 13th Annual Health Fair at Mundy’s Mill High School. I urge you to attend and take advantage of a host of free screenings at the Health Fair including: breast cancer screenings, prostate cancer exams, HIV testing, blood pressure checks, blood donation, body mass index, dental, glucose, kidney function tests, cholesterol, orthopedic, spinal, general vision, glaucoma and others. Participants include Emory Hospital, Grady Health System, Morehouse School of Medicine, WellStar, AID Atlanta, Sisters By Choice, Resurgens Orthopedics, Radiotherapy Clinics, YourTown Health, American Kidney Fund, and many more. Click here for a full list of participating healthcare providers. The Atlanta VA Medical Center and VA Regional Office will return to provide mental health services, medical appointment scheduling, disability claims updates, and referrals for veterans services. Throughout my years in public service, I have been an advocate for women’s health. That is why I introduced three resolutions that bring awareness to specific women’s health concerns: uterine fibroids, polycystic ovary syndrome (PCOS), and endometriosis. I am proud to partner with PCOS Challenge, Inc., who will be at our 2017 Health Fair, to bring awareness to PCOS. With my introduction of H. Res. 495, it is the first time Congress has ever independently recognized PCOS, and I am honored to lead this historic, bipartisan effort. I look forward to seeing you on Saturday at our 13th Annual Health Fair. Bring your family! Bring a veteran! Admission is free but please come early to take full advantage of the Health Fair. For more information, please visit www.davidscott.house.gov or call 770-432-5405. I also encourage you to follow me on Facebook, Twitter and Instagram for up-to-date information on the Health Fair and my work on your behalf in Washington.